Thank you to anyone visiting this site and taking the time to see what my contribution to the coverage of boxing is all about. Hopefully after reading a little bit of my story you will be able to see where my passion for the sport of boxing is rooted from. I have loved the sport for half of my young nineteen-year-old life. Through some of my teenage years I trained in the sport at Barry’s Boxing Center here in Las Vegas, Nevada. I am originally not from here, I was born in New York City on August 30th 1991. I lived in Brooklyn, New York until 1997. Due to various problems my mother, without giving notification to my father or any of the family, she took me away from them in one fell swoop. This caused a lot of problems for me growing up. For one, I had no siblings, more specifically older siblings; this caused bullying to run rampant at a young age. When another child would get into confrontations with me, that they usually started of course, they often would utter the words to the likeness of “I’mma get my big brother, and he’s gonna beat you up.” I could not ask my mother to back me up, so I would be at a loss for words. Other forms of intimidation worked too. I have always felt that I was never one to start confrontations, I loved making friends and speaking with others, no angel certainly but I knew which barriers of respect you were suppose to give to another person. Despite my attempts for camaraderie, I did not have many friends when I moved to Las Vegas and did not for many years. Similar to the sibling situation, kids would have power in numbers and I’d be on the helpless side. Through growing up I took my licks from an increasingly drug-addicted, alcoholic step-father. As well as kids whom had a few years on me. These beat downs created a desire over time to merely have the ability to really put some hurt back on somebody. I just wanted to feel comfortable in my own skin in just about any place, any time. Fast forward to 2005, I had turned 14 and was already in love with the sport. Something really spoke to me about seeing two men duke it out in a test of intelligence, speed, conditioning, mental toughness, strength,punching power, and most importantly technique. I would see these men show the upmost respect for one another, to afterwards shake hands like gentlemen (most of the time, some of the time) and be able to hold their head high, win or loss. This “Gentlemen” side of the sport is something that I held to be very admirable. So it was my turn to use the sport as a vehicle of self defense, and then take it from there. I was in my freshman year at Western High School. I had already played little league baseball, and was a very good Youth Division football player. However I will never forget my first day of boxing training and how strenuous it was. As the famous quote goes “You don’t ‘play’ boxing.” I had liked boxing very much, but I was impatient in that I wanted to be somewhere as talented as the guys my age who already exhibited the potential of professionals. I was truly impressed, and indeed some of these guys were at the very tops in the world in their weight class. What was even more impressive is that these gentlemen were just that, gentlemen. They never flaunted the fact that they are armed with the forces to knock me, and most men, out cold. They were good role models showing that hard work, training, paying attention, and being without fear, is what makes a good boxer. The trainers, former professional fighters, were experienced and very nice men. I was grateful to be around some of the best amateurs in the world. At times some very, very notable professional fighters who would come through and train hours before the amateurs would come on in. After about 5 or 6 months of preparation I sparred for the first time, and like Marco Antonio Barrera for example, I got whooped. At first I walked away with my head down and cried when I got home, but when the tears dried I knew I would return the next day and improve. I did return and sparred much better than the day before, that trend continued, and was becoming more competitive with some of the guys in the gym. In time I grew to be decent, but I think I was still more of a fan than a fighter. I would speak to the best in our gym even though those inside the ropes knew much more I did, but they were not particularly avid fans of boxing. I would ask them about specific dates of bouts or historical facts, but it was something that they would not particularly harp on. As a matter of fact, during one of my last times being at the gym one of the trainers gave me the advice of “You have to worry about yourself, and not be such a fan of the sport sometimes.” Obviously that held some weight because the best in the gym would not find it commonplace to discuss past fights that were scored. They were just focusing on themselves, although I am sure they love boxing just as much, if not more, than I do. I was able to hold my own with any of the old timers in the gym, and then some. Speaking on fighters such as Jack Dempsey,Jack Johnson, or Rocky Marciano, as I had owned all their careers on DVD. I could fight, but I think I was better speaker. I did not know if I was going to be a fighter, a writer, a referee, or a judge. All I knew was that I was going to take whatever they gave me or whatever I could gain. I would tell the owner of the Barry’s gym that as long as I get in somehow and am a part of the community I would be happy. I knew years ago that I would be dedicating my life to boxing. I felt based on the merit of my passion, love for the prize fights, and my willingness to learn as much as possible I deserved to cover these fights and one day be apart of it all. Out of respect, I say right now if I were to gain a career in this sport I would go between the ropes again. Out of respect for the men I’m covering, I would be sparring again daily, so the fighters I’m covering could feel that, “hey if I’m going to talk about you taking some licks, I’m gonna take some licks too.” Simply to remain sharp and not overly grow as a spectator. I would like to keep that empathy and that true wisdom of how painful the fight game can be, solely for the genuine respect of the gentlemen I would be covering. I would also like to mention that since 2005 I had not missed a belt bout,when I attended the Bernard Hopkins-Jermain Taylor I Middleweight Championship bout. I was not until 2008 that I was not able to afford a bleacher seat for the Bernard Hopkins-Joe Calzaghe Light Heavyweight Championship bout. I was not handsome enough to gain the affection of the girls in my school, and I did not fit in with the schools most popular boys, usually athletes. With an open weekend, I would ask my mother for 75 dollars to attend the prize fights, I loved it. I had a such a great time that I felt as if I was not missing out on anything. My most enjoyable moments were when I would sneak down and get autographs and photos with my heros. What is funny is that I am now using these same techniques to get interviews today. I’m sure the fighters would rather me return to the former, I hope they understand I’m doing this out of a desire to have a voice in the sport of honesty, respect, and passion. I can never slander another pugilist by saying anything along the lines of “He’s a coward.” That is nonsense to me, any man who steps between the ropes, especially in front of millions of eyes, is not a coward. When I would meet these fighters, my heros, I was impressed and happy with how gracious a majority of them were. Out of all the athletes I was lucky enough to encounter, boxers were typically the most modest, kindest, and yet the baddest. I was very appealed to that duality, something I tried to incorporate in my life. That I’m the kindest of kind to the kind, but I can be the baddest of the bad to the bad. These guys, unlike the bullies I encountered when I was little, had no bravado most of the time, nothing to prove to anybody. For we already all know the dangers that lie in testing one of them foolishly in combat. To sum this all up, I promise all my followers and supporters, to do my best to dignify the sport in my reports and columns and any writing I contribute to the sport. I promise to do my very best to give people who like me, growing up, are in love with the sport. The best coverage I can do with absolutely non bias, journalistic integrity, and that same passion that they posses. I promise to learn and to grow in this profession as much as possible. My goal is to have my dream career one day in covering the sport, and to have the fans never feel as if I am in it for the money or any other reason besides my desire to be there to witness the history and speak on it. To take the torch from elder boxing journalists, writers, and fans alike and make them feel as if they’ve left it in good hands with me. I never want you to feel as if I do not deserve or should not be writing about this sport. My mission is to be the best I can be at what I love, writing,covering, and speaking on boxing. Thank you, for taking the time to read this too-long but quick biography. I hope you enjoy what I do. God Bless. I met this guy in vegas on saturday night, at the khan-judah fight. I was with him outside the changing room as I was hunting for photos, but you were extremely unphased by the huge names and idols you were interviewing, and handled yourself with great professionalism. Just wanted to say this guys is extremely passionate about the sport, is only 19 with great journalistic potential. So keep it up mate, I hope you achieve all your goals and I’m sure you will go from strength to strength! Thank you very much! 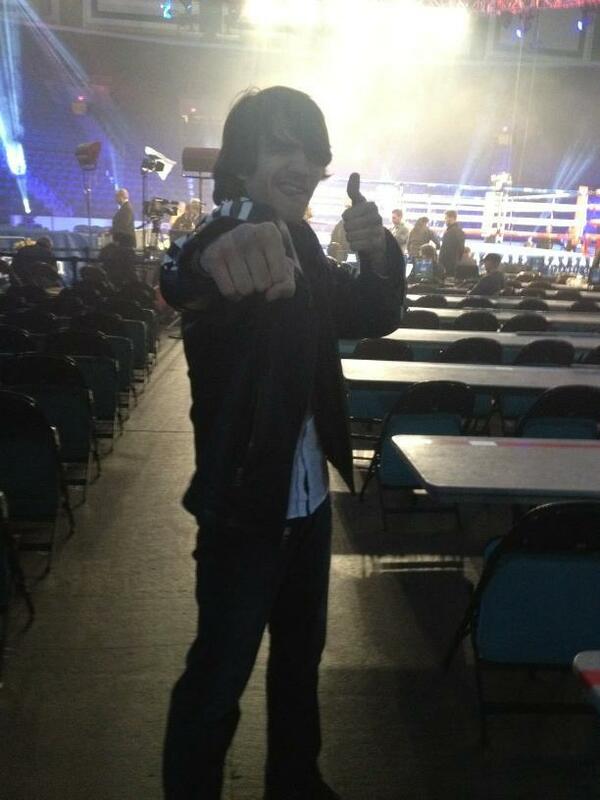 I hope to see you guys again at the fights. I think I will seeing as how Khan should be on his way to some marquee matches here in Las Vegas. Cheers! great job…i knew you could do it. so pround of you. keep up the good work. love you …best of lucky. Z…The site looks great. Big difference from the first time I visited. Barbara and I are getting 60 day chips tomorrow.